I’m writing this post on the last Friday of September, 2013. The weather on the coast has devolved into its single digit lows, and forecasts of rain, showers, and cloud. It seems both so recent, and yet so distant at the same time somehow, that we were coming back into school suntanned and anxious about the start of another new year, about routine, and work, and the intensity of life that will build to its apex in June. Sitting here now I feel much removed from the scattered headspace I brought with me out of summer; I feel sharp, motivated, and as though I can visualize the goals I’ll have for the coming year in a way that August and the first week of school didn’t allow. What happened these last few weeks that facilitated this shift? Each of the TALONS classes has been away on a weekend retreat, for starters, with our afternoon class joining our friends at Sea to Sky Outdoor School in Gibsons, BC, on the first weekend of September, and the morning group camping in the woods of Sasquatch Provincial Park, at Hicks Lake. 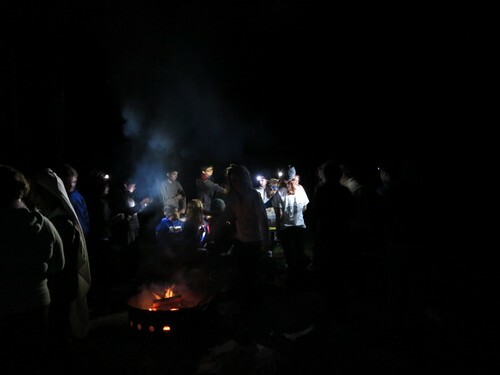 Already, these groups have bonded over campfires and songs, communion with one another over meals, and the wilds of the outdoors in hikes, voyageur canoes, and nights under the bountiful stars. There was also the magical happening of an encounter with the wonder that is bioluminescence, which never fails to disappoint. I’ve introduced a new cohort of Philosophy students to the idea of conducting their learning in the open, and the course site is already a hub of conversation between our for-credit participants, course alumni, and a few open online learners. And on the weekend summer officially ended, I made my way to my family’s cabin to take in the traditional Last Gasp of Summer that is the Pender Harbour Jazz Festival. September, it seems, has no shortage of familiar rituals to help merge the summer into school year. To help frame the coming year in terms of where the last one left us. And to help acclimatize us to the rigors of work, once again. Soon, we will be researching Eminent People, and continuing through the Rites of Fall that sew the seeds of the TALONS spring and the academic year, and bring to the surface the narratives that we will tell in the coming months, something I’ve written about here before, though with a different focus. We need ritual, whether it feels imbued with grace or merely rote, because it draws us back to the physical world — which seems, always, like a distraction from the silence of pure communion. It’s a temptation, for me: the longing to withdraw from action and other people and become a contemplative. I can really see the truth of the above quote here at the end of September, where my thinking has met with the focus of the new year, and the practical applications of my summer daydreams. I’ve been brought back to the physical world, in a way, through the comfort of the familiar, of being greeted by faces familiar and new, and doing what we always we do this time of year: engage with ourselves and our peers and colleagues anew, and find out where it is we are this time around. If that sounds a little opaque to you, no matter. It’s my own understanding that’s become grounded through these rituals. How have the Rites of Fall provided for yours?